Completed and being loaded with books. The Built-ins feature bead board, and rope interior and above-cabinet lighting. Ever heard any one say, "I have too many books?" No such thing! At Here's What You Do we regularly review books, recommend them in our Atlanta day plans, and generally agree you just can't have enough books. That all said, it's important to realize you may need to make some room for them. We think you should embrace making room. Take it up a notch! Recently - and partly to give our books a suitable home - we decided to shift around what we do with the rooms in our Georgian Colonial home. Our china collection, which is also huge, couldn't fit in the original 13' by 13' dining room. 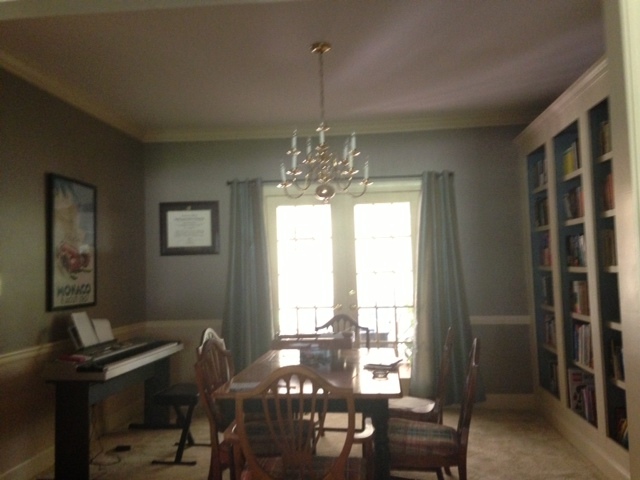 So, we converted our 19' by 13' family room into the new dining room and moved all the china to the built-ins in there. 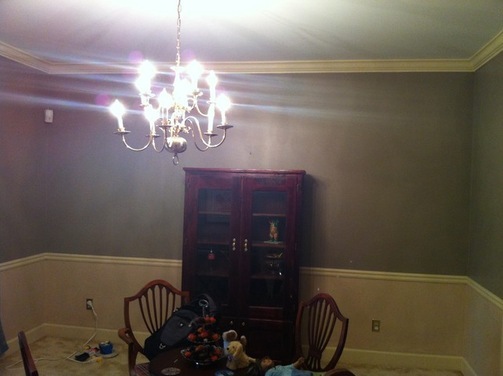 That left us with an unused dining room. Two words. Perfect. Library. We're half way there and wanted to share the progress. The plan is built ins. Huge ones. They will cover two opposite walls and hold about 2000 books. In the center of the room will be a baby grand piano. We're still arguing about if that makes it a library or a conservatory. What do you think? 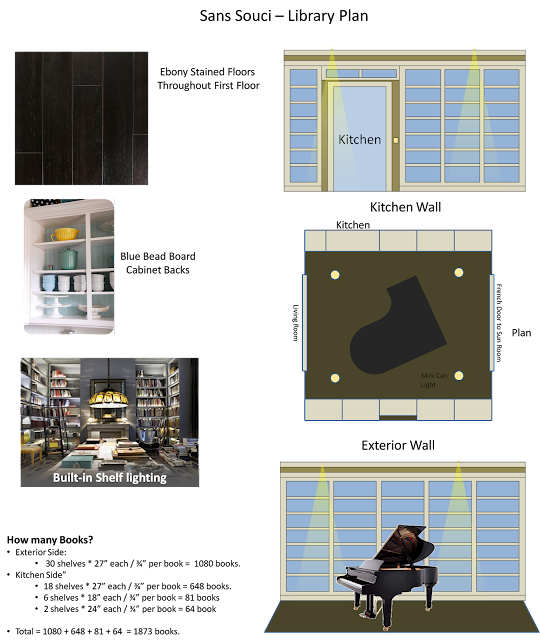 The plan is to convert the old dining room into a Library, with built-ins for almost 2000 books and space for a baby grand piano in the center of the room. 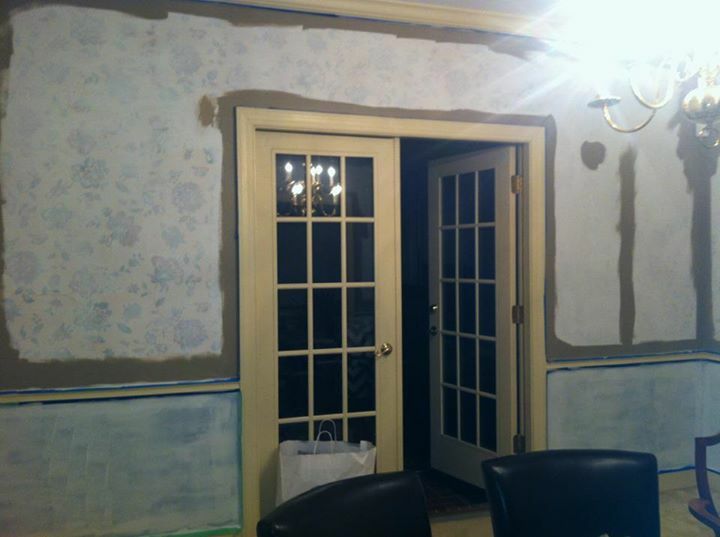 We're half way through with construction of the built-ins on the exterior wall. We're done with one side of built ins now. The pictures show that we started with mid 80s flowery wall paper and now have a fully internally lit build in book shelf that holds 1100 books. We're just ecstatic about it! 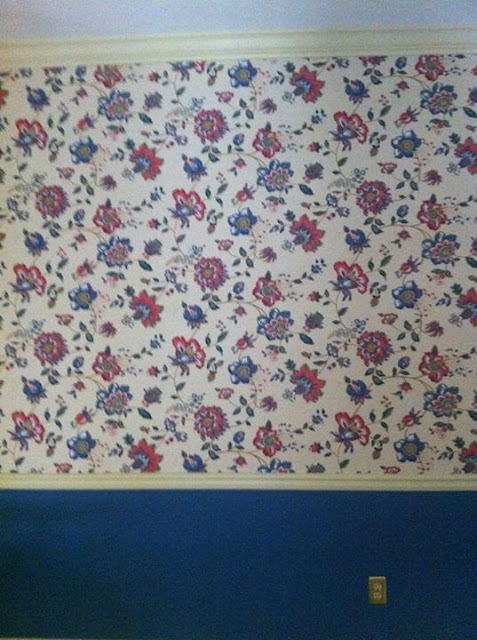 Before, the dining room had 1980's wallpaper, and lots of it! We tested lots of colors. Lots of Kilz primer helped with covering the wallpaper. 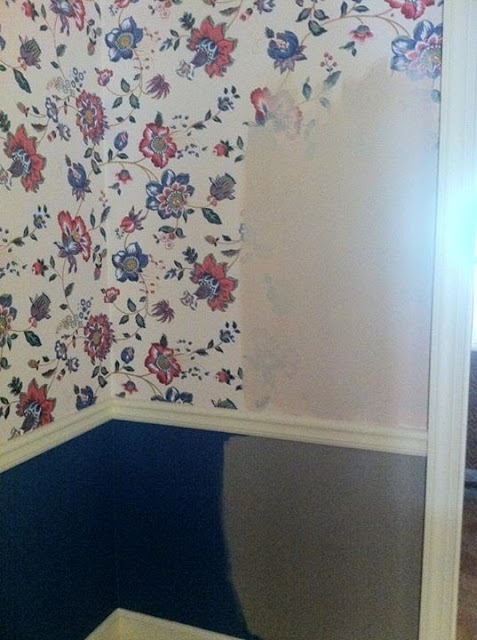 We went with a two tone look initially, though in the end the darker color above won us over and we painted the whole room the same hue. 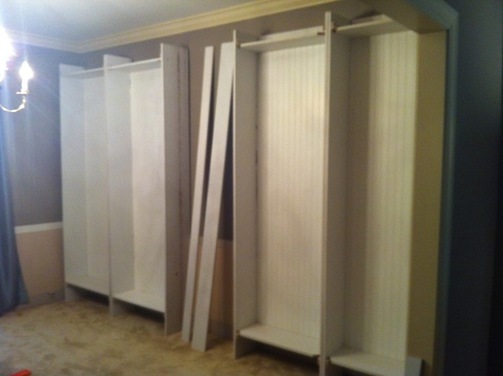 We fit in five 30" cabinets, all custom built in our garage workshop. Note the bead board backs. We think they add a lot of charm to the design. Adding the face frames to the cabinets really brought to them to life. We added in rope lighting behind the frames and above the cabinets for accent. 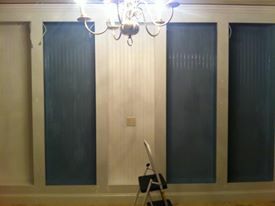 We went with a blue hue for the interior of the cabinets. 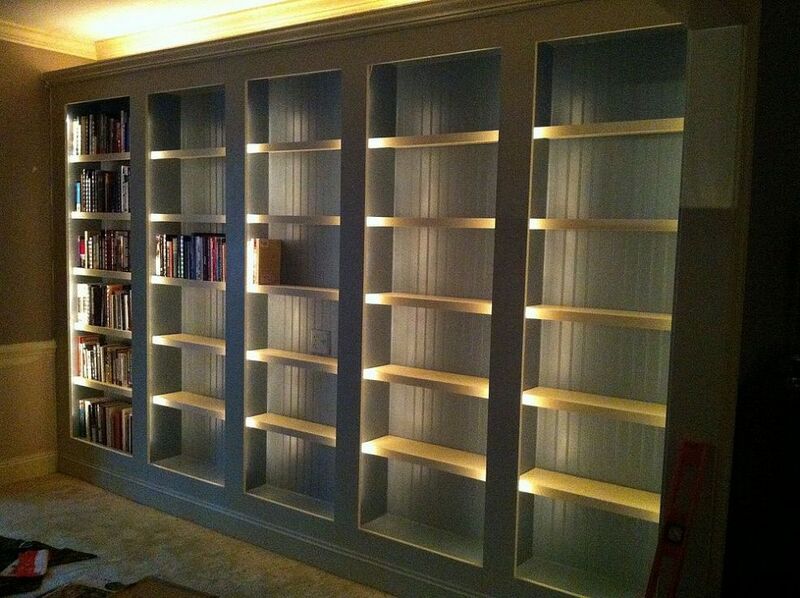 It was much brighter than the original plan when it first went on, but we love it as a background to all the books. The final look turned out great. The lighting turned out to be just bright enough to allow us to peruse the library without even turning on the room light! Andrea peruses the collection. In the end, we fit about 1000 books into this set of shelves. Half way done! 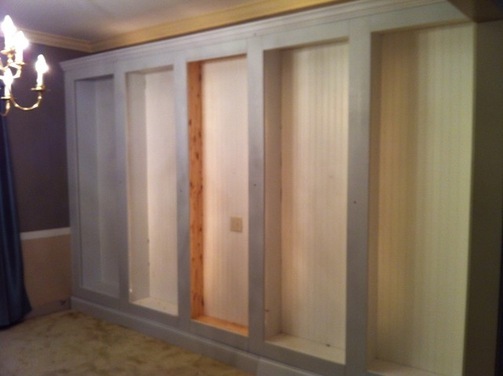 The finished shelves will be mirrored by a new set on the opposite wall. Once they're in, the plan is to remove the table and keyboard, and replace them with a baby grand piano. Exciting!